Mountain Hardwear ambassador Jesse Hambley rides glaciers with the extra burden of heavy camera gear. Jeff Steele photo. What do you do if you're the guy responsible for capturing your crew's whole day, but you're also supposed to be the talent in front of the lens? 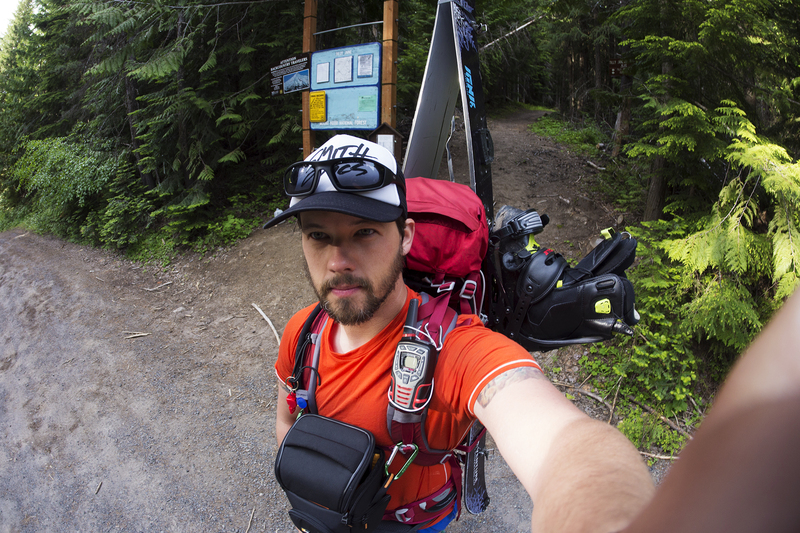 Can you handle a descent with an extra 15 pounds of camera gear? Mountain Hardwear ambassador Jesse Hambley works full-time, trains weekdays, and plans to film and ride glacier descents nearly every weekend. The Pacific Northwest-based snowboarder and photographer talks about how he strikes a balance between being a content creator and splitboard mountaineer, with only the time outside of his 9-5 to do both. Can you describe how you balance being a videographer, and finding time to push your own riding. Is there an inherent frustration that comes when you are doing when versus the other? The rare photographer selfie at the start of a dry approach. Jesse Hambley photo. There has always been a balance between my personal progression as an athlete and my creative side. I really got my start in photography and video through the BMX industry in my early 20's. I was always the guy who would stop whatever session he was in the middle of and happily run over to film a trick when someone asked. Enjoying these sports and creating media around them is really equal to me. But sure, it’s really hard to progress in one or the other sometimes when you have that mindset. I’m most certainly not the best snowboarder or athlete in our crew, but when I get home and I’ve come back with five or ten great shots, that frustration just goes away, and I am super stoked to share those experiences with people. Honestly, I can’t remember the last time I’ve gone out without an extra 10 to 15 pounds of camera gear and just focused solely on my riding. I’m hoping to do a lot of that this year. But if I’m not able to, I won’t beat myself up about it, or regret it if my photography and filming progress more. Photo of a photo: Jesse Hambley stops mid-desecent to shoot. Jeff Snyder photo. 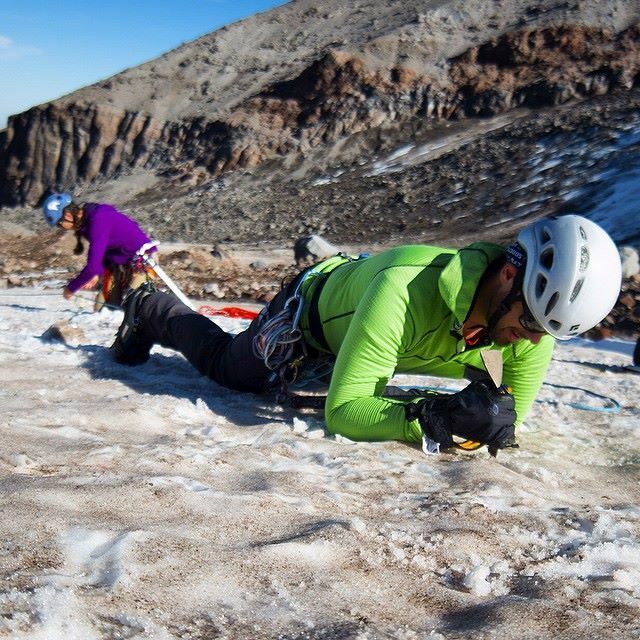 Can you talk about your role in Mountain Hardwear's Finding Winter program? Hambly with touring partner, Jeff Steele, on Flett Glacier. Jesse Hambley photo. When one of my climbing partners, Joe Kromer, reached out to me this past fall and told me to apply for the Mountain Hardwear “Finding Winter” ambassador program, I gladly did. He surfs with one of the guys over there and thought I’d be a great fit for it. The program is actually really cool and pushes the athletes to get out and tell stories about winter. I was already doing this, but it’s provided some additional direction as well as an outlet for what I’ve been creating this season. Each week, Mountain Hardwear sends us an adventure to go on, it can be something as simple as telling a story about the first time you saw the Cascade Mountains, or as crazy as doing as many sports as you can in one day. This season, I’ve been concentrating on really fast turn-around times. Especially with the Mountain Hardwear mission briefs, we usually get them on a Friday, and I try to turn something around by Monday or Tuesday. There is a few reasons I do this: one, because I love showing current snow conditions in my part of the world, and secondly because we are a watch it and move on society, so consistently releasing media is really important to keep people’s attention. The last project I worked on was a short video piece and article entitled The First Time I saw the Cascade Mountains. I was given the request for a piece in the middle of the week, and Mountain Hardwear needed it by Monday morning. With such a short turn around time, you don’t always have that many options, so you first start scouting out where has good snow conditions. The Cascades. Jesse Hambley photo. Since this piece was about the beauty in the PNW, I wanted film somewhere that was beautiful, had some great fluffy snow and was pretty accessible. Luckily, Crystal Mountain just got dumped on and still wasn’t open to the public. 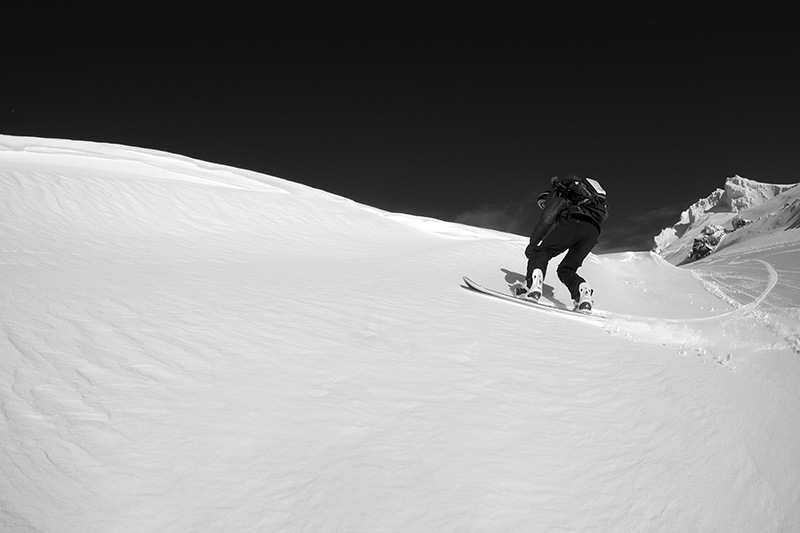 Access to their backcountry slopes is super easy and luckily I have a crew of inspiring friends in that area. Fortunately, I was also planning to tour in that area or Mt. Baker to do a photo shoot with Jeff Steele, who needed some fresh photos for LTD. Optics. 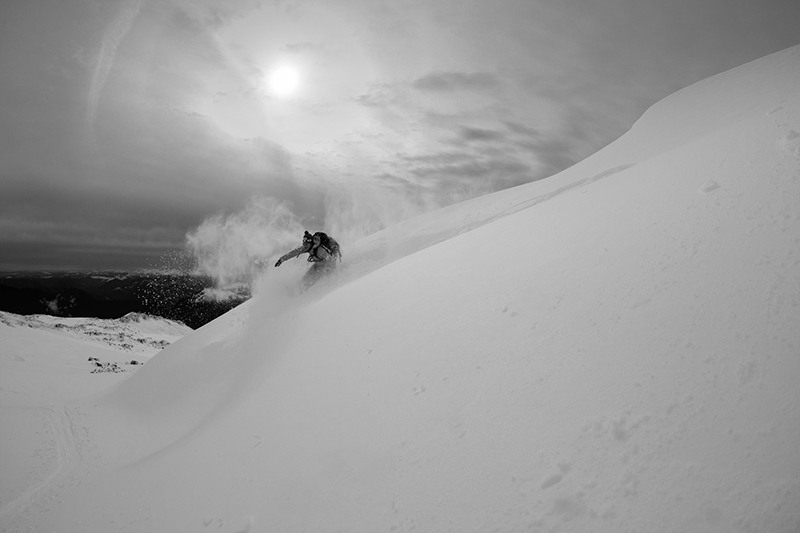 Jeff is also a great snowboarder who is a North Face Local Ambassador and rides for SNOCRU. So I was able to double up on the trip! How do you coordinate with other athletes to get shots and plan big descents? Rider Jack Wallis boots up Cooper Spur. Jesse Hambley photo. As I meet new people, I always try to get a better understanding of their backstory and who they are. It’s like walking into a store and taking a mental inventory for the next time you are shopping. Lately, it’s been really easy to immediately have someone’s story in mind when I get these prompts. Honestly though, sometimes it can come down to who is available to go tour as well. I also love working with athletes who understand that we are trying to tell a story to inspire people. Sometimes you go out and they just blow past you up the mountain, which doesn’t produce the best shots. If you were a marathon runner, you wouldn’t expect a videographer to run the race with you to get your story. Sometimes you have to set up shots and do them a few times, so the people that really get that are my favorite to tour with. Want great ascent shots? Down blow past your photographer. Jesse Hambley photo. Once I plan a filming trip with other athletes, I have to start the detailed process of getting ready. Not only am I checking maps and looking at safe slope angles, routes, and weather conditions in the areas we’ll be visiting, I’m also looking at where the sun will be coming in and trying to figure out what lighting might be like. After timing and location are set, then I get to packing all of the normal backcountry snowboarding gear, waxing boards, charging camera batteries, choosing lenses, cleaning camera sensors, putting together camera rigs, and repacking a few times to get the lightest pack I can. All in all, the entire gear and route planning part of the trip can really take four to five hours. Even if the partner I’m touring with is familiar with the area, I always research it myself no matter what for safety. Since I’m usually driving two to four hours to get into an area to tour, it gives me a lot of time to do some planning in my head while I drive. I sometimes make audio memos or have Siri transcribe notes for me. I realize that sometimes these never work out, but it gives me a little bit of a plan until I get out there. How do you set up shots while you tour? Does you need to get great shots conflict with the desire to ride big lines? Sunset lap on Flett glacier. Jesse Hambley photo. While touring, I’m constantly trying to stop and look around for places to set up a shot, angles that would look good, and how to make the camera shots really show the intensity of the slope. Sometime shots just look like you are on a bunny slope even though they are really 45 to 50 degrees. A lot of the time, I never get to ride a cool line because I’ve opted to not climb the chute because the angle would be better set up lower down or on a different aspect, sometimes I don’t climb them because of the extra weight I’m carrying. I’ve been pretty okay with this though, like I said before, I get super stoked by capturing the shot, too. Not the bunny slope. 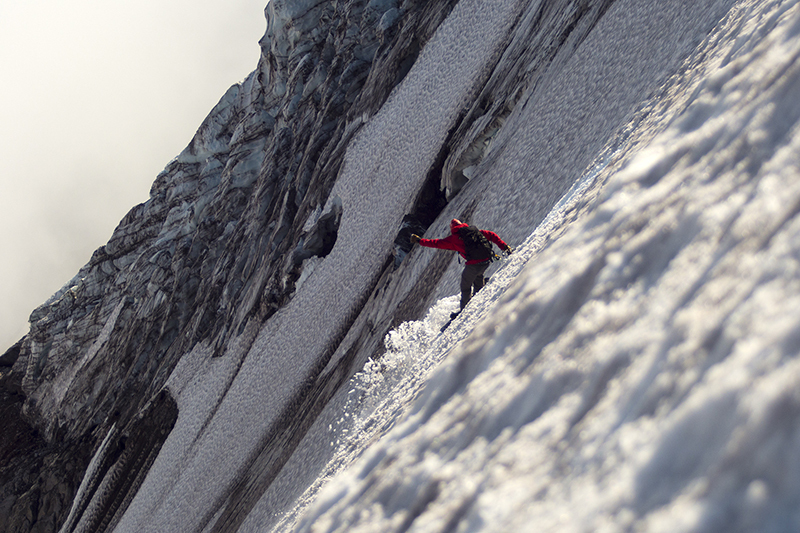 Jeff Steele drops into Paradise Glacier. Jesse Hambley photo. The filming process usually involves a lot of waiting for good lighting, for the riders to climb a slope and the frustration of trying to keep my camera gear protected from the elements. Other times, the filming process can be run-and-gun because conditions are deteriorating and we need to get off the mountain immediately. Fortunately with a trip like this past weekend, it was super leisurely and we were able to set up 5 to 6 really good shots. 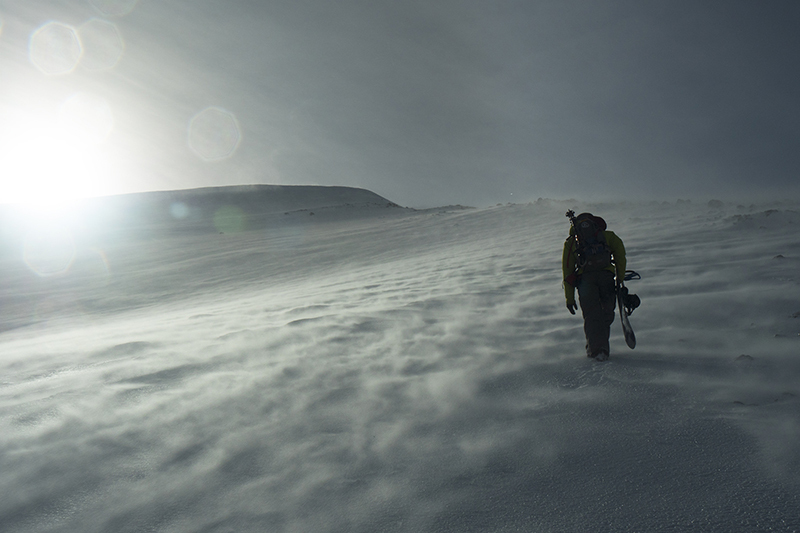 How do you handle snowboarding down steeps after a long tour with a heavy pack? I have to ride with the weight I carry for most day tours, so my riding is often survival and managing my way down. Taking a fall with that much extra gear can really crush you, along with set me back for awhile until I can replace broken gear. During one of my most recent trips, I really only got to take a few runs down the mountain, but I came back with about six really sick video shots and a handful of good photos. Are there certain descents you have your eye on? Rider Jeff Snyder traverses Mt. Hood. Jesse Hambley photo. Jeff Steele, his wife, Kelly, and I did a ton of research this past summer to ride some corn and scope out areas to film this upcoming year. So we have some things in the works. Since I’ve put my name out there and people know I want to tell stories here in the PNW, I’m planning to jump on some already planned bigger descents, too. 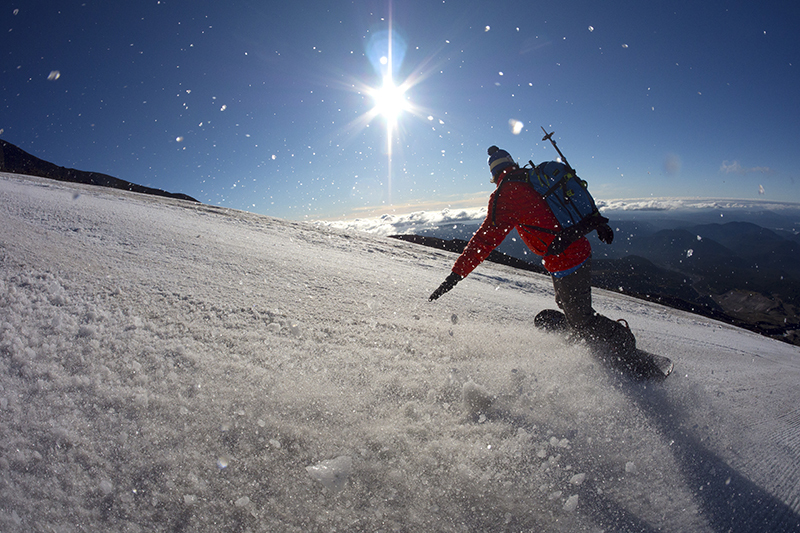 Some include a Cooper Spur snowboard descent, Mt. Rainier snowboard descent, and a backcountry trip down to the Sierras. Personally though, I’d like to just to ride off a few of the local mountains, like Mt. Adams and Mt. Hood, without all the extra camera weight. It’s really provided an opportunity to tell the stories of the people around me. Since we usually only have a week turnaround time, it’s made me quicker at coming up with creative concepts and getting stories out. I’ll really be dedicating this season to telling as many small local stories as possible. Can you talk about splitboard mountaineering on Pacific Northwest glaciers, and how riding that terrain shapes what you want to ascend and descend? Spring overnight with the Steeles. Jesse Hambley photo. I feel really fortunate to live in the Pacific Northwest. This past year was the first time I’ve been able to do turns all year, and it’s really one of the best places in the US to do it. With sufficient glacier snow on Mt. Hood, Mt. 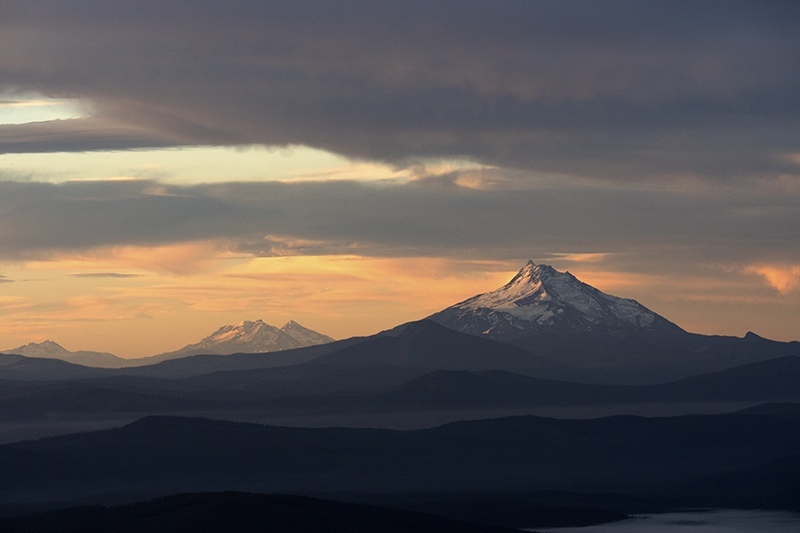 Rainier, and a few of the other volcanoes, in the warmer seasons, the commitment level is usually only about one long day or two day trips to high altitudes. This has really shaped the way I look at snowboarding now. When I lived in Pennsylvania, I thought snowboarding was a seasonal sport. After winter ended, you hung up your boots for the winter and started your summer sport. Not here in the PNW. The approach and style of riding changes, but you can still snowboard. While other parts of the country are hanging up their skis, we are just getting into the good corn and climbing season. 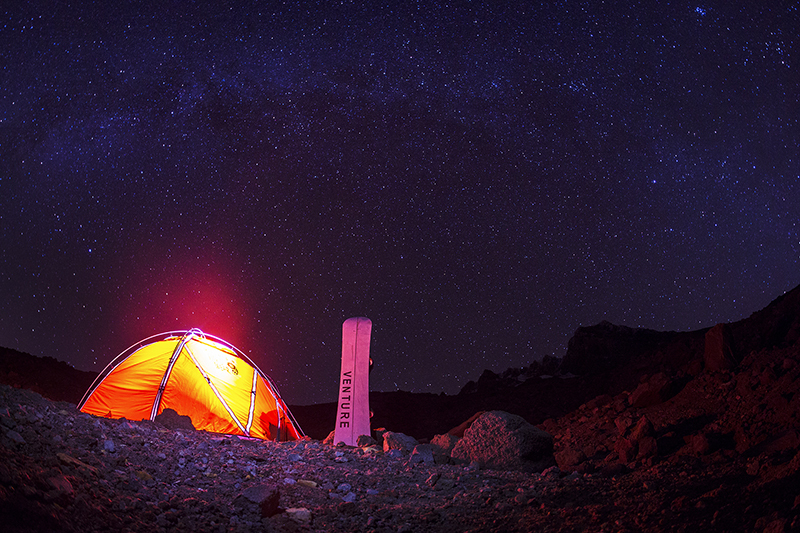 Around late spring and early summer, we change our approach to focus more on overnight trips. We pack our boots and rock boards on our back, slip on a comfy pair of hiking boots, and prepare for hours of hauling them longer distances to high altitudes. We go from riding powder and corn snow to sometimes riding baked sun cups and ice. It’s all still snowboarding, just a different style and commitment level. Even when we have a really bad winter, we still get more snow than most places in the United States. Our winters continually dump snow in small increments, so there is usually always a refill on the mountains and something soft to play in at lower elevations. As far as higher elevations, things can be super brutal with extremely high winds and all kinds of ice. You have to become a really versatile rider here and be ready to ride anything. I’m still trying to master that myself. The biggest change in perspective to me is now wanting to combine snowboarding with other sports like rock climbing, cycling, freshwater snorkeling and thru-hiking. I haven’t gotten to do a lot yet, but it just makes sense. 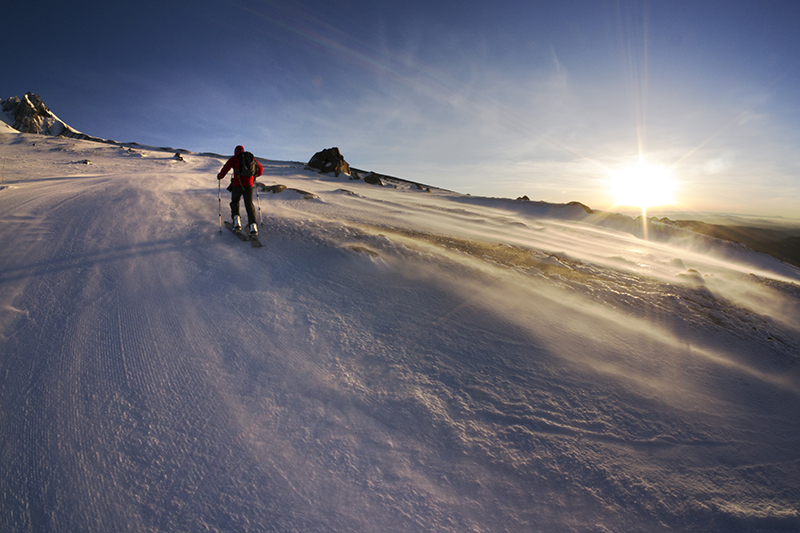 Why not plan your summer sports around the snow and have the best of both worlds? Can you talk about how glacier travel skills have progressed riding PNW glaciers, and the kinds of skills people need to ride them? Self-arresting with an ice axe is a critical skill for PNW glacier travel. Jeff Snyder photo. Since we are on glaciers, this has also changed how we snowboard, too. We are constantly learning and trying to progress our skills on the mountain so we can stay safe. I haven’t had a ton of formal mountaineering training, but I’m a huge researcher and I always try to go out and practice what I read. I also try to learn from good friends who can show me a thing or two. 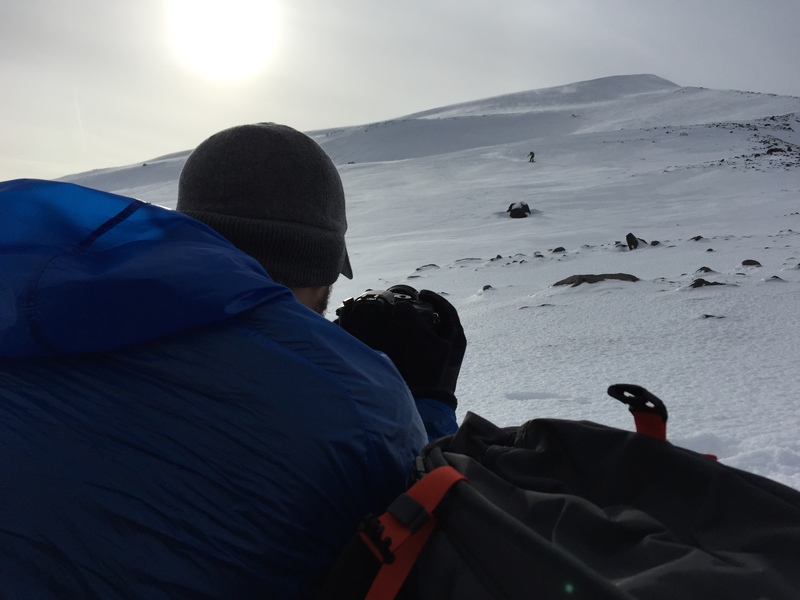 Knowing your basic self arrest techniques with an ice axe, using crampons and general knowledge of glacier ice and snow is a must. You shouldn’t be snowboarding on glaciers unless you have some understanding about them and the hazards that exist. Dangers like knowing when crevasses are filled in and safe to ride or when they could collapse on you in the spring or summer are really critical to be aware of. You want to know when seracs and cliffs are going to start launching ice and rocks down at you because temperatures have warmed up later in the day, or if the weather will keep them frozen in place. It’s also good to know how to build a few different kinds of snow anchors and how to repel or belay someone if you have to. Rider Steve Ladish skins up a ridgeline. Jesse Hambley photo. Next would probably be some practice in crevasse rescue and medical training, which I’m currently working on myself. 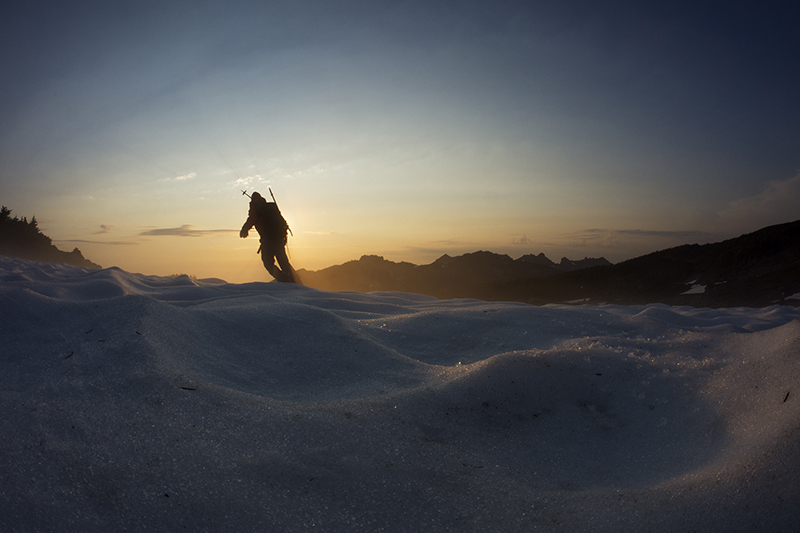 The more you learn and push your mountaineering, the more it opens the terrain you can access. 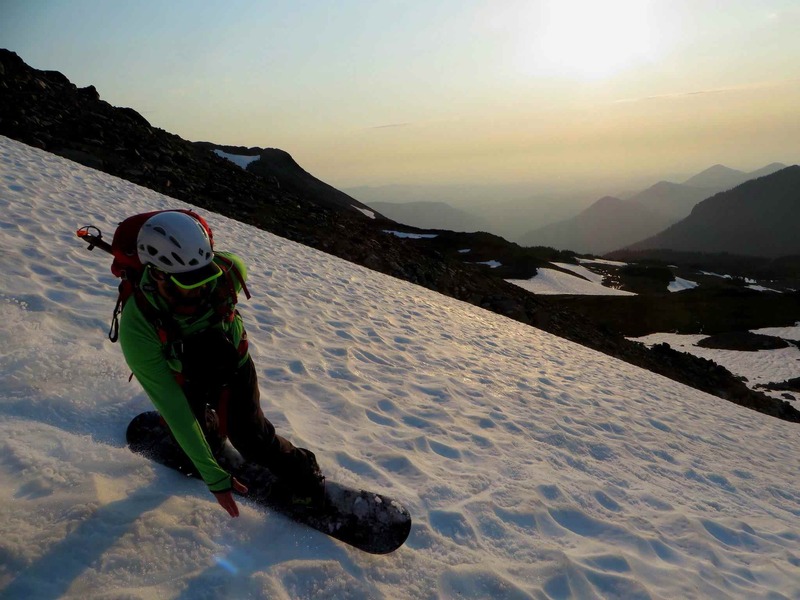 A lot of the summer months, it’s really survival snowboarding and you are dealing with everything from crazy rain storms high up to open crevasses suncups of solid ice on the slopes. From my experience so far in the PNW, I’ve seen how versatile the snowboarders are here. In the early winter conditions, you have to be really good a riding shallow snowpack and have really good control over your board to avoid rocks, trees, and changes in the type of snow in a single run. In mid-winter, you have to be really good at riding really heavy and wet powder in lower elevations and ice mixtures in the higher elevations. During the spring, you get a mix of crusts and really wet or soft corn snow, and often need to be good at sluff management. During the summer it’s really a crap shoot and you find everything between corn snow and solid ice or frozen sun cups. So really, each season offers something new for you to master. Your riding can only progress as much as your mountaineering skills do, too, as coming home safe is always the first priority. How did you come up riding glaciated peaks, and pursuing larger descents? 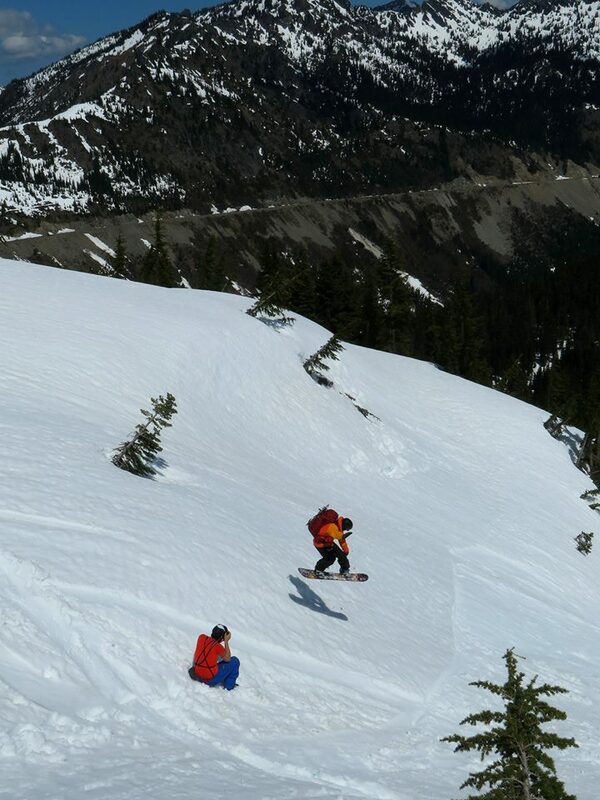 Jeff Steele rides Rainier in bluebird conditions. Jesse Hambley photos. After high school, I took 10 years off from snowboarding, and heavily pursued my human rights and creative career. In this time, I still rode BMX and cycled everyday, but I slowly started getting into mountaineering and climbing as an escape from working at a desk for 12 to 14 hours a day. After moving to the PNW and getting more into mountaineering three years ago, I really saw snowboarding as a faster and more thrilling way to get down than booting it. That was kind of the start of it, now it’s pretty much transformed the way I look at mountains. The descent on a snowboard is really at the forethought of climbing and filming it. Can you give an example of how you wanted to climb, ride and shoot a certain place, and how that influenced the planning? 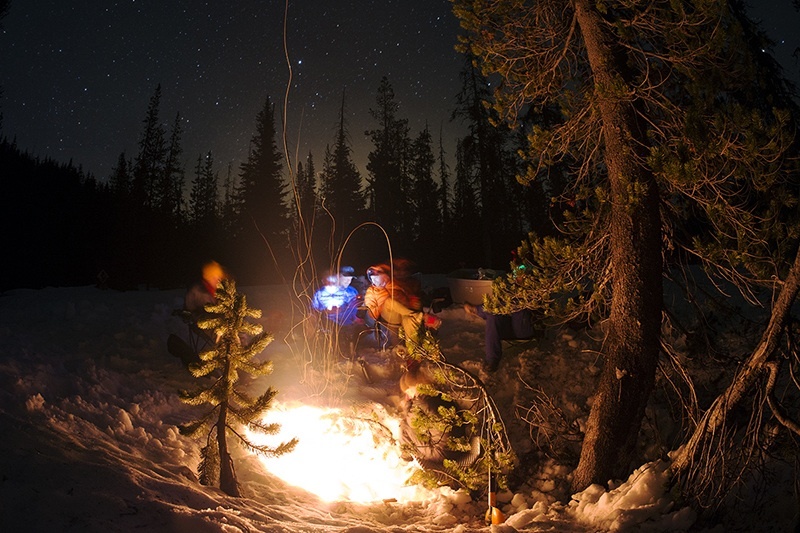 Winter camping is required for many major glacier descents. Jesse Hambley photo. I got a text from Jeff Steele this past summer after he sent a few pictures of an old trip report up on the Flett Glacier on Mt. Rainier. I love riding with Jeff. He’s super stoked all the time to try new big lines, and he has a really good eye for spotting stuff that is aesthetic looking, too. He told me about a line he wanted to try on the Flett Glacier headwall. After we decided that it was on, the planning usually starts a few weeks out. First step is planning the trip from a climbing standpoint: when will the weather be clear--maybe have a little cloud cover so we get some good contrast--but mostly when will the snow be good enough to ride? We usually spend everyday texting back and forth discussing the upcoming weather and altering plans as needed. Once we have a weather window set, the next question is: Can we get off work? Next is route planning. This involves getting familiar with the route options out there, researching old trail reports, photos, looking for water sources, finding or buying topographic maps and acquiring the permits we need. I always carry a compass and map with me, but I’m heavily reliant on my smartphone as a backcountry tool now. I use a mix of caltopo.com to research slope angles, create my routes and then export that to Alltrails.com to use on my phone in the field. I store a ton of photos I’ve found of the area along with backup topographical maps, interview questions and shot lists on my phone. It’s also great because you can take photos as your approaching to reference later on your exit. So this process can take a few nights after work to accomplish. 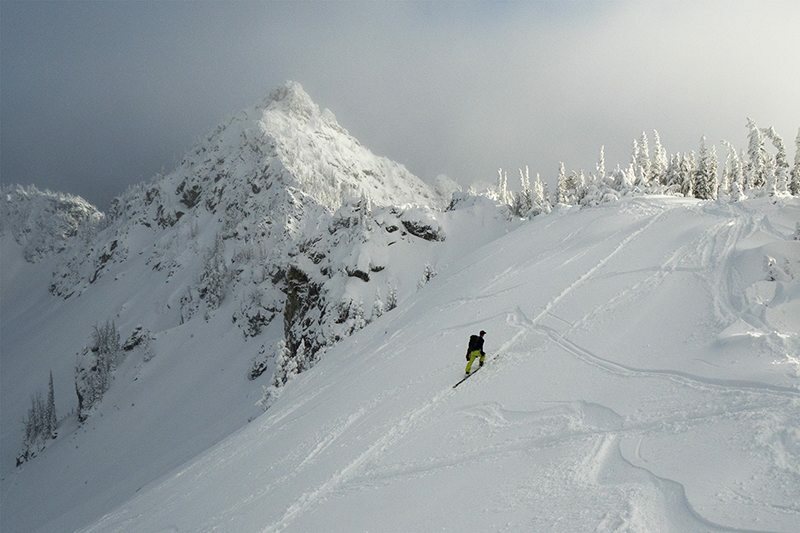 Jeff Steele enjoys some late summer pow on Mt. Hood. Jesse Hambley photo. Next is the production side. This involves deciding if we want to just do photos or try to film something. Sometimes it depends on what the athlete needs for a sponsor or self-promotion. In this case we really wanted to travel in to research the area for another trip in early spring conditions, so photos would be it. In this case, I knew we’d have some beautiful views of Mt. Rainier, so I opted to pack a handful of lenses. Usually three days out I start to pack, but this really depends on how long of a trip we are doing. In this case we planned on going for three days and two nights. I pull out all of the overnight gear and decide how much torture I want to put myself through. Since I’m carrying up to 10 to 20 pounds of extra camera gear sometimes I have to sacrifice some comfort. In this case, Jeff was packing up their two person tent so him and his wife Kelly could stay in it. I opted to pack a small bivy sack so I could drop the extra tent weight, but knew I’d be sleeping in it with hot summer temperatures. Summer camping before a long approach. Jesse Hambley photo. After the overnight gear is done, I move on to my mountaineering gear and decide if there will be a need for an ice ax, rope, crampons, etc. 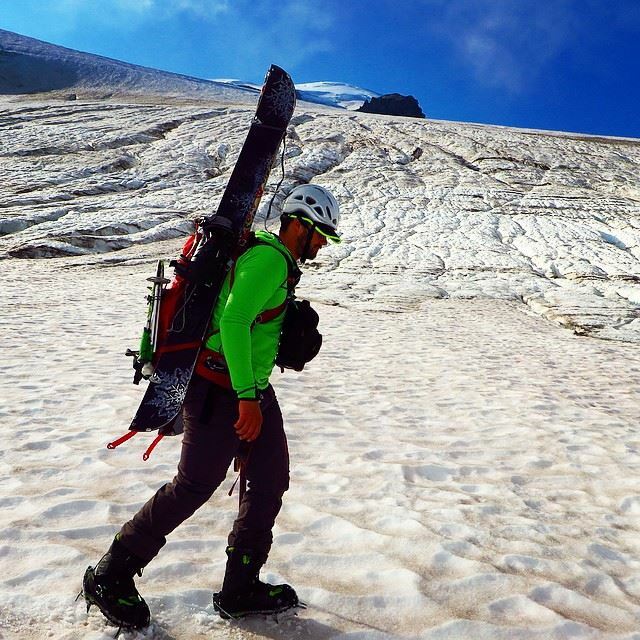 Anytime we are on glaciers, we usually pack our mountaineering gear to be safe. Next is cleaning, setting up, and packing up the camera gear. Lastly is repacking it all to see if I can drop any weight anywhere. Now that the packing and research is done, next involves usually driving overnight to get up to Rainier and carpool. From there we headed to the ranger station to get the permits and debate with the rangers. Since this area is a little off the beaten path, we made the mistake of not reserving our overnight permits in advance and a climbing party had already reserved a zone we wanted. After battling with the rangers for 30 minutes and having to prove that we knew of another zone we wanted to stay in and could navigate there ourselves, we finally got our permits to spend the night at the edge of an empty marsh near the glacier. We have a serious mosquito problem up here, and in this case, I can honestly say where we camped had the most mosquitos I’ve ever seen in my entire life. I remember looking over at Jeff that evening after we set up camp, and he was covered in hundreds of mosquitos. He’d shake and a swarm of black would appear around him. We have a serious mosquito problem up here and in this case, I can honestly say where we camped had the most mosquitos I’ve ever seen in my entire life. I remember looking over at Jeff that evening after we set up camp and he was covered in hundreds of mosquitos. He’d shake and a swarm of black would appear around him. Anyways, after hauling our overnight gear and boards about three miles and a few thousand vertical feet up into our zone, we set up camp. Out of nowhere, a storm set in and it looked like we were going to get hit by a heavy rain storm. We scrambled to set up our tent in the 80-degree weather, but wait–I decided to only bring my bivy sack. As Jeff and Kelly hunkered down in a tent that barely held them, I sadly crawled into a waterproof bivy sack in the blistering heat. After a few hours of sweating in my comfy sauna, the storm passed and we began our next few thousand foot gain up the Flett Glacier to gain the headwall. This is one of those cases where managing my ride down had to happen. As we started to gain the ridge up to the headwall, snow conditions started to turn more into ice than soft corn snow and I wasn’t willing to risk snowboarding down them with all my gear. I managed a less steep line down and would setup a long shot at the bottom of the headwall. Even this less steep slope was hard to manage. I lost my edge on an icy spot and ended up sliding down about 15 feet before I caught my edge again. The fact that Jeff and Kelly took on the headwall in those unpredictable conditions was really impressive to me. We usually communicate over radios, so it’s always great to talk through the conditions and shots from a couple different angles. In this case I was a little worried because I could see that every jump turn Jeff would do, he’d slide the steep headwall down about 15 feet before he’d grab an edge again and initiate his next turn. Sometimes your riding turns to survival riding on these glaciers, since no matter how much research you do, the conditions can change so fast. After everyone was down safe, we headed back to our new home in the marsh. This is when the mosquitos attacked. We tried to take some photos of the beautiful sunset the mosquitos kept photo bombing every single photo and we finally gave up. After about 5 hours of trying to escape these bloodthirsty things and knowing the change in snow conditions, we made a call to head out in the morning instead of stay another night. Even though you’ve put so much time in to planning, you have to just go with the flow and change your plans. I think that’s a huge part of riding these volcanoes, you have to remain adaptive at all times and be okay with it. It really changes the entire perspective of the approach, everything from the starting time to what’s going to be the best snow has its part in the initial planning stage. Can you talk about the challenges you experience shooting in these environments? Hambley setting up for a shot. Danny Ceglia photo. I’m always trying to find more filming partners to come on trips with me and when they do, it’s a constant reminder of how harsh the conditions we shoot in really are. A lot of the time I hear comments about frozen fingers, how difficult it is to expose everything in the scene, and how heavy our gear packs are. It’s definitely not for everyone, and not everyone can handle it. I think some of the hardest struggles for me is always trying to keep up with the athletes while carrying an extra 10-20 pounds of camera gear, clothing, and medical gear. How do you manage working full-time, creating content, and riding? 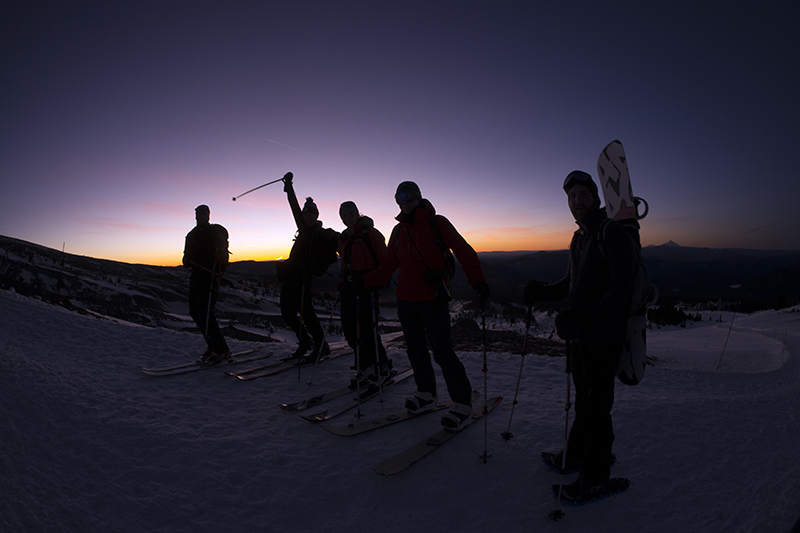 Hambley's Portland-based crew celebrates a sunrise lap. Jesse Hambley photo. It’s definitely hard to find a balance between working full-time, riding, and producing media. I think everyone who has a passion for the outdoors tinkers with the idea of doing it full-time. I currently work full-time as a graphic designer and a front-end web developer. So these skills have kept me a weekend warrior for the past 10 years, but at the same time have been able to fuel my passions. Many of the ski bums and semi-pro athletes I know are really struggling to provide a sufficient living for themselves, but at the same time are willing to give it all for their passions. I think I’d love to find a middle ground there and find a way to combine it all in the outdoor industry. With my non-profit background, I really would love to see our industry taking environmental and climate issues into our own hands. I have a lot of respect for companies that are willing to put forth their money, brand and business practices to protect our environment. Ideally, I'd love to be part of a company someday where I'm stoked about our product and can help inspire people to get outdoors and love it. 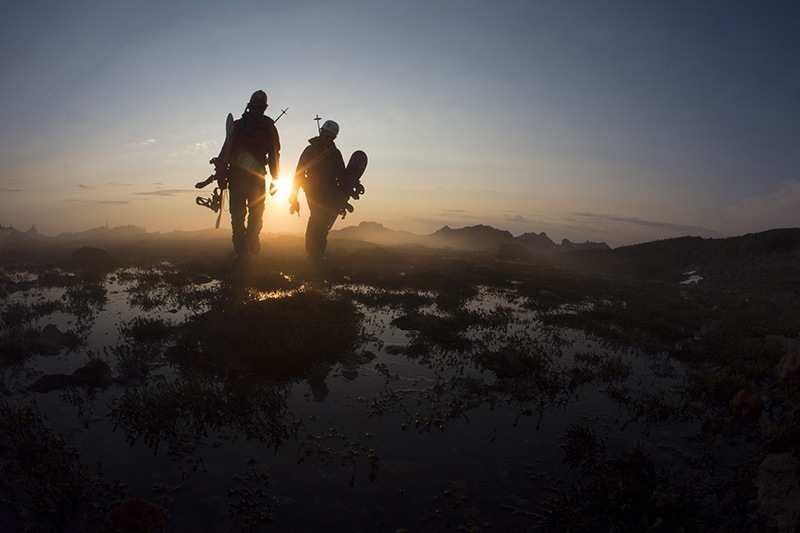 People naturally will fight and protect what they love, so we need to provide them with the inspiration and the equipment to get out there to make that connection. I just want to leave this place better than when I was brought into it and that’s what fuels me. I'll always be learning in this journey, so ask me at the end of my life what's the best way to accomplish this. Besides the challenge of making a living and paying bills, there is a mental and physical struggle, too. I try to squeeze in two to four hours of exercise a day, but it can be tough to incorporate that into my daily schedule, and I have to beg forgiveness sometimes from my girlfriend, family, and friends. Can you detail how you begin the planning stages of filming, touring, and riding during the week and when during the day you fit that in? Firm suncaps? Time for crampons.Jeff Steele photo. My average week looks something like this when I’m fully healthy and can fit in my routine. Monday: I usually cycle 7.5 miles into work, send emails or text with fellow touring partners to see what might be possible this weekend. After work I head out to do 2 miles of speed hiking in the hills of Forest Park, after gaining a thousand feet, I usually trail run 2 to 3 miles back to the office and pack up my stuff and cycle home. Monday is usually date night with the girlfriend so we relax some together. Tuesday: Almost a repeat of Monday, but this time I’m usually adding in an additional hour of rock climbing. Lately, I’ve been replacing this with what my friend Sean O’Connor and I call “Mad Mountain Men Unite,” where spend the evening doing some night missions. Wednesday: Usually a repeat of Monday’s routine, but I usually opt to hike with a 35 pound pack instead of trail run. This is also when I have an evening schedule to do photo and video editing for anything I couldn’t finish during the weekend. By this time we have a pretty good idea on what we’ll be touring during the weekend. I’m working on my route planning and packing my gear. Thursday: Usually a light day of cycling into work and spending the evening with my wonderful and understanding girlfriend, Sylvia. Often after she leaves, I’ll finish up packing. Friday: After work I’m usually trying to get to bed at around 8 pm for a 2-4 am start. Saturday and Sunday: Depending the mission, I’ll be out in the mountains shooting photos and stories. This isn’t always every week, but with how things have developed this year and with all the new people I’ve begun touring with, it happens every week or two. I try to be realistic though, as I have a wonderful group of friends and a girlfriend who don’t tour. So I’m always trying to balance this aspect of life as well. It can also be extremely demanding on my body, so sometimes after a hard tour on the weekend, sitting at a desk on Monday feels relaxing, but by mid-week I’m mentally ready to be back out in the mountains and living life. It’s hard to explain to people who don’t climb, but after being in hazardous conditions, life seems a little uneventful until you’re back out in them. Way to generate a little bit of stoke for being totally committed to the desolation, solitude, and physical/ endurance bit of mountaineering. Most people dont want to hear about the things that you need to do in order to be prepared for a multi-day ascent with technical downhill ride in the backcountry. Your training regimen is pretty spot on. And the way you frame the daily lifestyle/ fitness component of things was awesome. 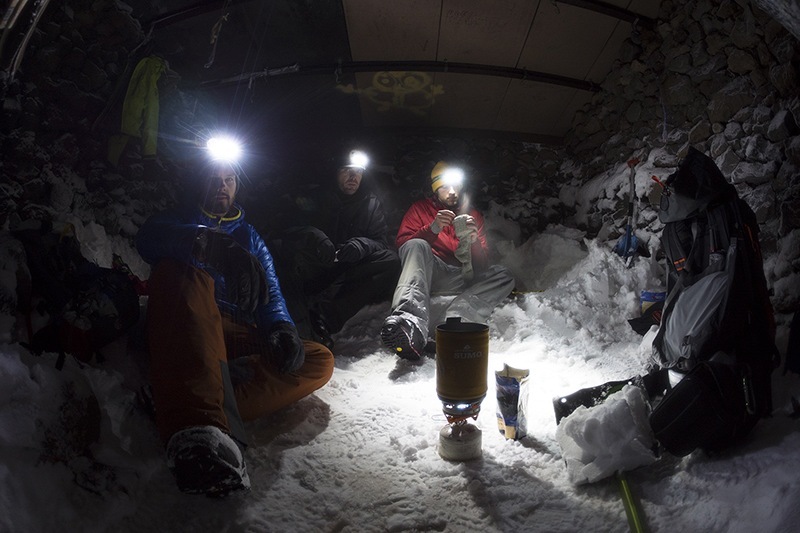 Heavy bag back pack work, and night missions are essential for anyone considering ascending and descending alpine terrain in snowy conditions. Knowing that you have what it takes to continuously generate your own heat is another. You devaluate the experience a bit though by having omitted any anecdotal, or pictorial information on the subject of nutrition other than you and you r crew eating a hot pot under an imporved lean-to. Clearly you appreciate the importance of hydration, as well as the risk if improper loading of nutrients and elemental salts. Not that your going for a man vs. wild approach, but your readers want to know just how difficult it is to meal plan over the course of a three day tour where you are required to bring the calories needed to ascend and descend 7-10k vertical. Keep rockin’ the PNW, and beyond. Wow, guys, you are so cool! I can recommend you new tools that you could try these outhttps://samedaypapers.com/research-paper-writing-service</a>for your next trip. And it will be awesome.